I finally had a chance to sit down with Oracle WebCenter recently, primarily to give the wiki functionality a test drive. I wanted to test in a virgin OC4J 10.1.3.3 container (as opposed to the Preconfigured Standalone OC4J) just to make it interesting and see all the moving parts. As far as I could discover, there's not a great deal of information available on the topic. In this post I'm going to chronical the specific installation procedure I used to get WebCenter Wiki running under OCJ4 10.1.3.3. This is the end result we're after.. The documentation for WebCenter Wiki is a little obscure when it comes to installing in a "plain" OC4J container. It turns out to be pretty straight-forward, but just as mc said in the forums recently: "Oracle documentation just make it look difficult"! 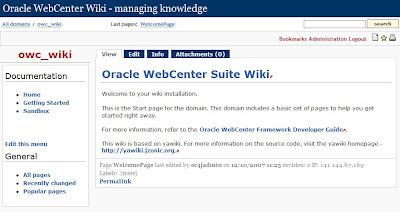 The installation documentation for Oracle WebCenter Wiki is actually found in the Oracle WebCenter Framework Developer's Guide. 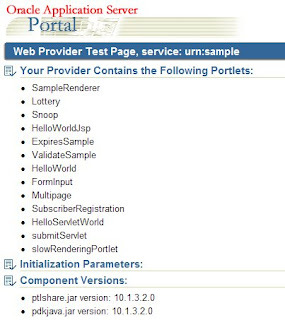 Which points to Portlet Development Resources and Downloads for the additional portlet and ADF configuration required to prepare the OC4J container for WebCenter. I'm going to document the install steps here in the order I actually executed them. Variations are possible. I'm installing this under Windows XP, but the same applies on other platforms (just switch \ to / and use the appropriate command shell syntax). To be precise, I am using "Oracle Containers for J2EE (OC4J) 10g Release 3 (10.1.3.3)". I won't cover in detail here. Basically you need to unpack and startup. The only thing you may need to configure are the port settings to avoid conflicts with other services. Using Enterprise Manager (http://localhost:8888/em or similar), go to the "Applications" tab and deploy the %PDKPATH%\pdk\jpdk\v2\jpdk.ear. Once done, you should be able to successfully access the sample providers at http://localhost:8888/jpdk/providers/sample and get a page like the one shown on the right. Explode the Oracle ADF Installer, which uses a silent "runInstaller" to install. # The absolute path to the directory containing the ADF jars to be installed. # to be installed. This has to be one of the following choices. Restart OC4J at this point. BUT, if you were like me, my container failed to start at this point with Error initializing server: Shared library "adf.oracle.domain" could not be found..
Annoying, but no panic. Edit ORACLE_HOME/j2ee/home/config/server.xml, re-order the shared library entry for "adf.oracle.domain" (I moved it to just after the "oracle.persistence" shared library) and try to startup again. If you try and hit the wiki now (http://localhost:8888/owc_wiki) you will probably get a 500 error because security is not started or configured. For this test, I'm just going to use the out-of-the-box Java SSO File-Based Security Provider. In EM, startup the Java SSO application (look under the application group "Middleware Services > Other Services"). If you try and access the wiki now, you should see a login form but get an error when you submit because we need to generate the Symmetric Key. Every time I go to do this, following the Java SSO documentation, I struggle to find the right link in EM. To be clear, in 10.1.3 look for "SSO Configuration" on the Administration tab of the OC4J container (below). Go to the page, make sure "Generate new symmetric key" is checked, select your key type, and click "Apply". You will be prompted to restart OC4J. Browse to the wiki again and we have .. Success! Remember we're using the JAZN XML security provider rather than OID or other directory. Andreas had a nice post recently on how to Add a user to the JavaSSO, and that's what I need to do to add a personal account for myself..
JAZN is a bit dumb compared to using a real directory, so you need to restart OC4J again to pick up the new credentials.